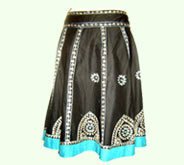 An exclusive range of belted full skirts available in a variety of colors, patterns and designs. Mostly, cotton fabrics are used ensuring ultimate comfort to the skin. Zip fastening on the back of the skirt, buckle fastening, and several other features make this range of skirts very desirable. You can tuck in a skinny long sleeved t-shirt and slip into some serious platforms. Desc : Amazing blend of contrast colors. Featuring white elaborate patterns and blue border at bottom, black colored belted full skirts can be fastened with zip and belt easily & comfortably. 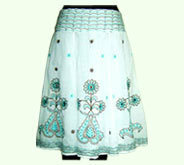 Desc : High waist skirts have been ornamented with multitude of blue complex patterns on white fabric. These ladies full skirts are wearable in summer as well as winter season. 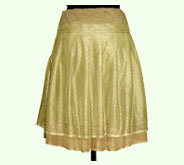 Desc : Ladies cotton skirts have been decorated with embroidery of paisley designs and frills of golden colors at bottom. 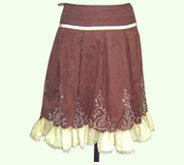 Pure cotton of these skirts absorbs the sweat and deliver a cool & comfortable feel. Desc : Exquisitely designed to perfection, designer skirts possess stylish cut & pleats. 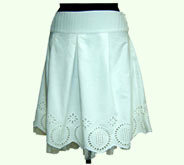 Round & rhombus designs and blue & white shades add an element of elegance to these skirts. Desc : Charming & unforgettable gift for flower lover ladies. 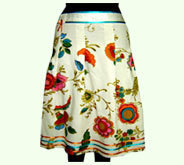 Pretty designs of multicolored flowers have been gracefully embroidered on these skirts. VariegateDesigner Skirtsd patterned stripes enhance their splendor. Desc : Certain to make heads turn. Meticulously developed from soft golden fabric, ladies skirts having frills will definitely multiply the flawless beauty of wearers in an unique manner.